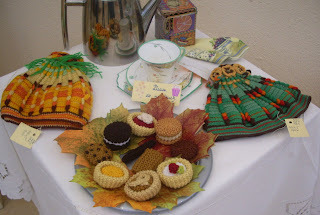 Another plate of no calorie treaties, these were all knitted, to go with the knitted tea-cosies. Thought I was looking in a mirror there for a bit ......these two tipplers are just brilliant. This wonderful quilt, "Memories for Grandma" was made by one of the talented ladies based on the book on the right. 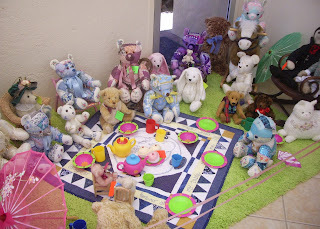 http://www.fibreinspirations.blogspot.com/ I know just how hard it is to get those little suckers to line up and all play happy together. If you ever get the chance to do her workshop, do do do., funny lady and a great tutor, I learnt more than my "you just need to learn a couple of things and its worth it"at her workshop. A framed work of Hardanger, the pic just doesn't do it justice, it is beautiful. And an embroidered teapot, again the pic doesn't do it justice, the needlework is so fine, stunning. Somehow many of the photos taken didn't download from the camera and I deleted the card before I realised. Fooey! So cannot bring you the "Tea Cosie Challenge" but I can tell you some of those cosies were really out there, it was so hard to pick one to vote for. But I did get the fresh flowers in the Ladies Loo.......nice touch. everything about the set up for the day was beautifully done, oh and best of all, there was afternoon tea, with pretty tablecloths and the tiniest little tidbits to nibble on..........Take a Bow, Ladies and Gents, on a job extremely well done.